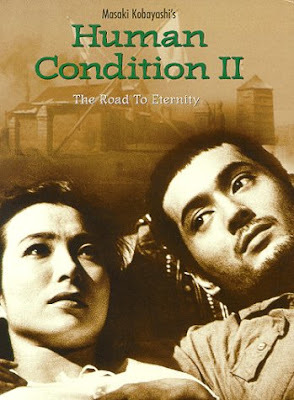 Conscientious objector Kaji, now forced to serve in the Japanese army, helps a friend defect to the Russians and nearly goes with him. But despite his opposition to war, Kaji does his best to serve as help and guide to the men in his charge, most of whom are doomed to fall to the relentless attack of Russian armored divisions. The Road to Eternity is the second film of Masaki Kobayashi's The Human Condition trilogy, an epic tale based on a novel by Gomikawa Junpei. In this film, Kaji (Tatsuya Nakadai) is now a soldier in the imperial army, as the oncoming Russian army swiftly approaches the Japanese lines. Here, whatever shred of humanity he had left from the end of No Greater Love is trampled upon ten times over and instead of the idealistic goal of helping everyone in sight, he is forced to just try to keep himself alive.